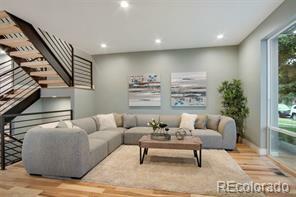 Contemporary new construction with high end finishes. Gorgeous chef’s kitchen with a quartz center island that can seat a kids soccer team. Stainless appliances, a pot filler for the cook top and a microwave drawer. Hardwoods on main, open wood and steel stairs. Custom metal railings inside and out. Hand trowel, flat, level IV wall texture. Two master bedrooms options, on 2nd and 3rd floors. Finished basement with a 9' ceiling offers an option for an additional bedroom. Built in new energy code. High efficiency furnace & water heater. Over-sized garage with 8' high door and built-in storage. Fenced yard with sprinkler system. 17 year old Emerald Maple in the front yard. Expansive 3rd floor 338 sqft exterior space with mountain views. Close to light rail and the new entertainment and food options south of Sloan’s Lake.